Adhirasams i made it for the first time. 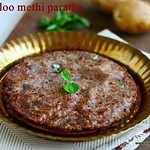 Many of them make for adhirasams for Diwali but we don’t have the tradition of making this for diwali. 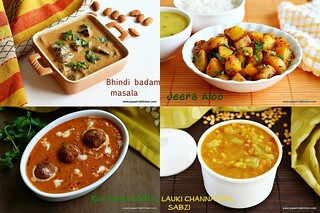 But i wanted to try my hands on Adhirasam. I tried it in my mom’s house when i went in June. My sister’s sil helped me out but unfortunately it was a big disaster. 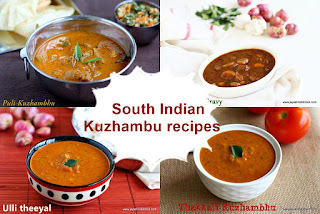 My mom went for a function in Trichy 2 months back and there she asked the samayal mami the exact proportion and also the nuances of making adhirasams. 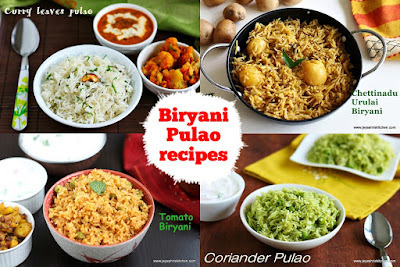 And she tried this in small quantity at home and gave me the exact recipe. 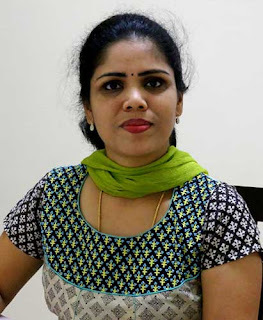 Yay i got perfect soft adhirasams. 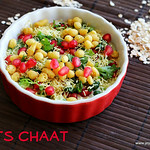 Actually i tried this during Navaratri itself , though i wanted to make again today, i was totally running out of time. 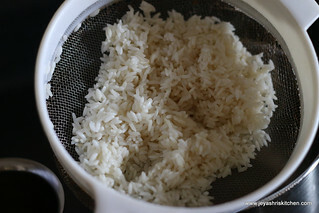 Soak the rice in water for an hour. 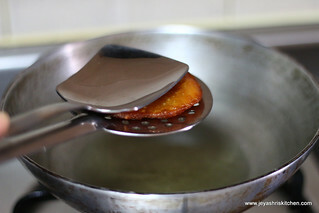 Drain the water in and just keep it in a vessel which has holes or in a big sieve. Do not spread the rice. Just allow the water to drain and le the rice has moisture content. 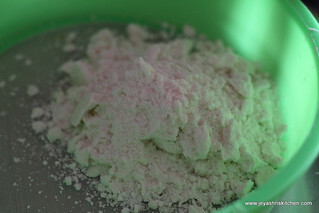 Make it into a powder in the mixie. Sieve this and keep it aside. The maavu will slightly have moisture content. 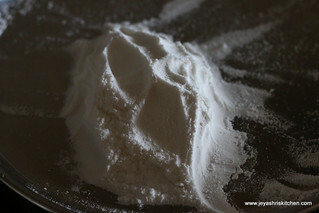 Cover the flour and keep. 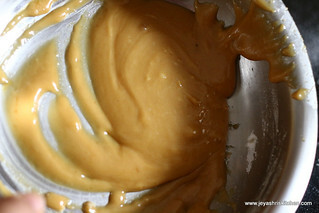 Add jaggery in a pan and melt the jaggery and filter the impurities if any. Allow this to boil till it comes to the soft ball consistency. This is very important, if the paagu will be hard then the adirasams will be hard. If the soft ball doesn’t come this will get dissolved while putting in oil. 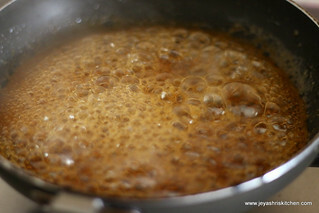 By putting the jaggery syrup in water it should come like a collective mass and form a soft ball. This is the right consistency. 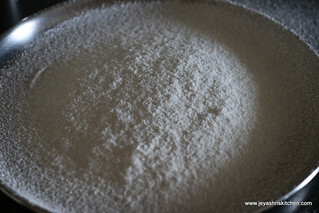 Add this syrup to the rice flour which we made. Add cardamom powder and sesame seeds. No need to roast the sesame seeds. Mix it well. If it is little not firm it is ok. After 12 hours it will be perfect. 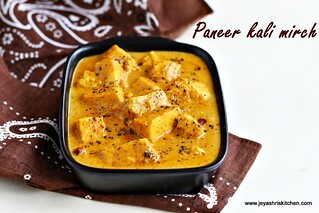 Keep it covered and let it rest for 12 hours.No need to keep in fridge. Let it be in room temperature. After that take this and make it into equal sized balls. 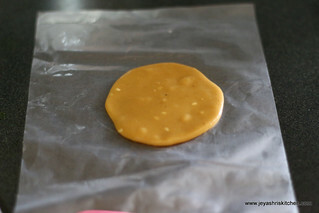 Take one ball and in a ghee greased zip lock place this and flatten this with your hands. Do not flatten too thin. Take this out carefully and put in hot oil. Keep the flame low. 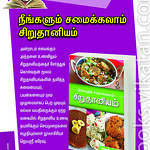 the adirasams will cook very fast. 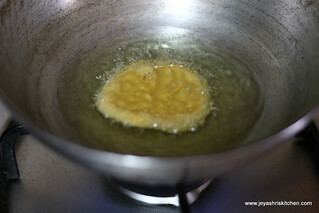 Fry on both sides till golden brown and when done with the help of 2 ladles flatten the adhirasam and remove the excess oil. 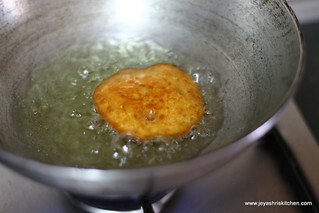 The adirasam may fluff up while frying. No need to worry, by doing like this it will be flattened. 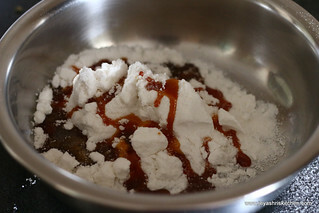 Repeat this for the excess dough. 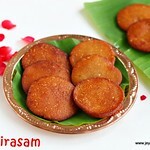 Soft adirasams are ready to eat. 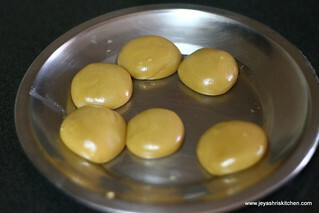 Always ensure that the jaggery is in right consistency. 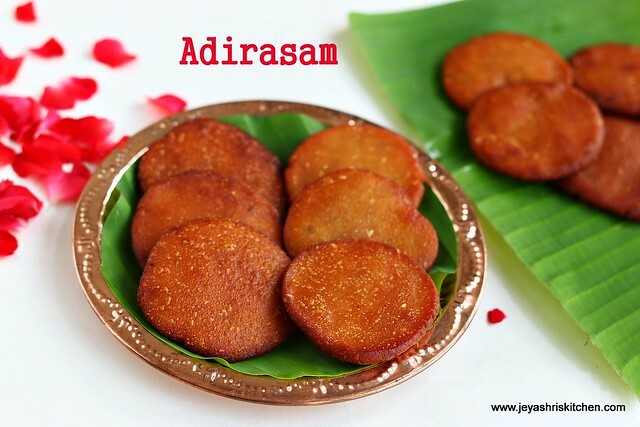 If it goes hard or little lesser than soft ball the adirasam will dissolve in oil. 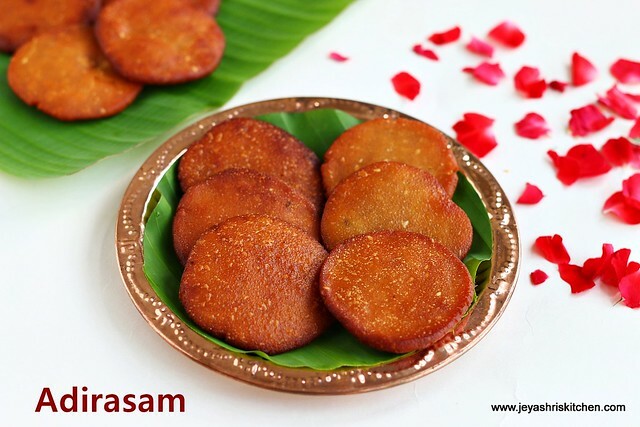 Always use fresh home made flour, store bought flour will not work out for adirasam. 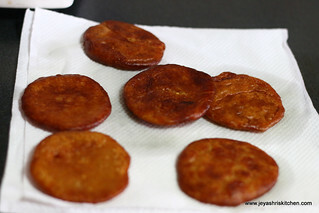 I used bit nice dark colour jaggery. 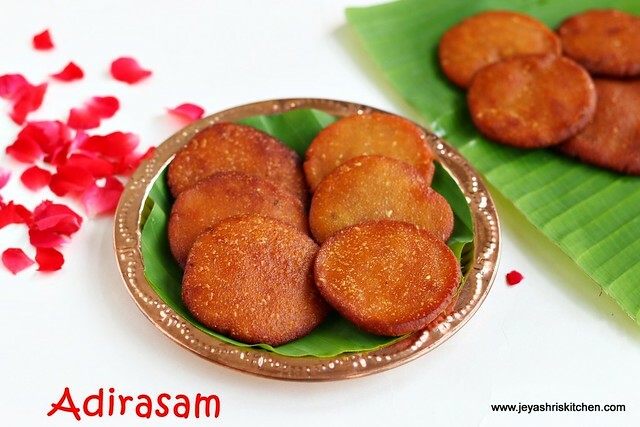 Colour of adirasam depends on the colour of the jaggery. If the dough is hard , adirasams will be hard. So ensure that the dough is soft. Resting time is more imporatnt. Even 2 days resting also ok. 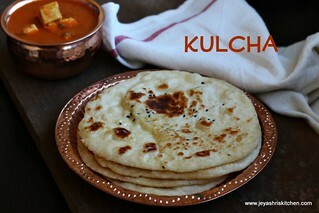 Resting will give soft adirasams also it will not absorb more oil. 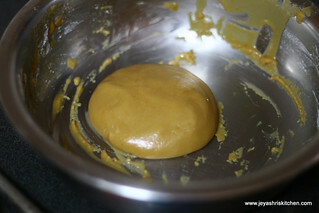 If you feel the dough is too hard add some jaggery syrup again and mix. 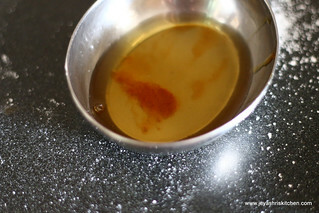 Ensure that the jaggery syrup must be of soft ball consistency.